Q Can the height be cut into a shorter length? 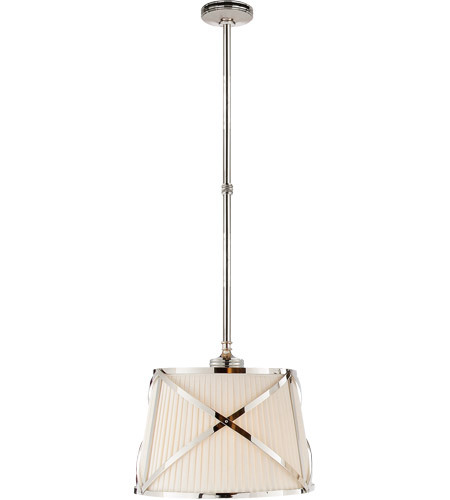 A The height of the Visual Comfort Chart House Grosvenor Single Pendant in Polished Nickel with Linen Shade may be customized. Please contact a member of our knowledgeable staff for more information at 866.344.3875 Option 1. Q Can the shed be easily replaced if it becomes dirty? Q Does this light come with a white shade? A The Visual Comfort E.F. Chapman Grosvenor 2 Light Hanging Shade CHC1480PN-L is only available with a Cream colored linen shade. 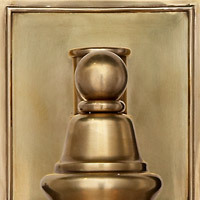 Q Can this pendant be made as an almost flush mount, with a 6-9" drop from the ceiling? A The Visual Comfort E.F. Chapman Grosvenor 2 Light Hanging Shade CHC1480PN-L is supplied with 2 rods - (1) 21" and (1) 18". Custom height available: minimum overall height 18". The item cannot be modified with a 6-9" drop. Q Do you have these in lilac or blue or do you merely put a blue bulb in it? I saw this on Houzz in lilac! Also, I saw it with ringlet chain as opposed to straight rod. 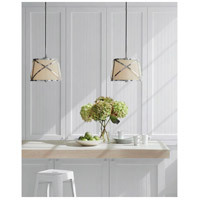 A The Visual Comfort E.F. Chapman Grosvenor 2 Light Hanging Shade CHC1480PN-L is not available in different color shades.